As a social enterprise Greenside Up seeks funding from all avenues in an effort to provide support and education to people volunteering in social community gardens. 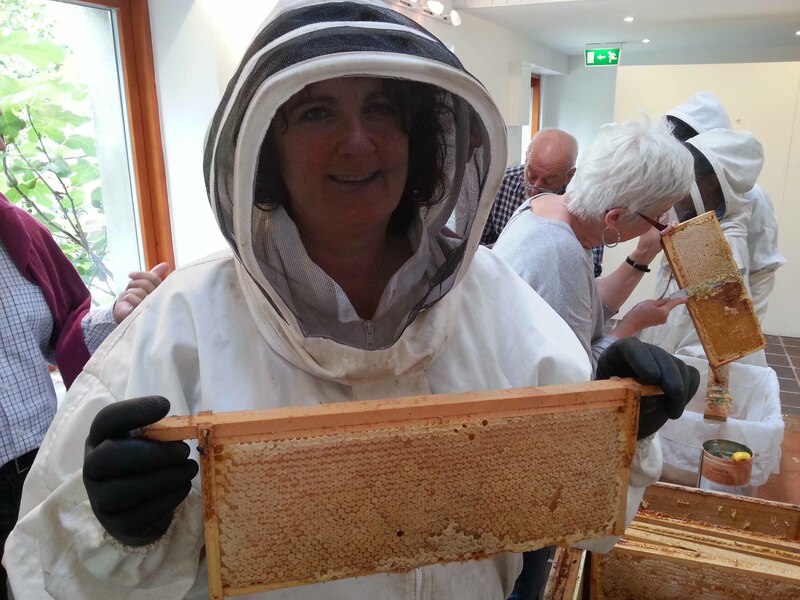 During the last round of Local Agenda 21 funding, Carlow County Council funded a project in Gleann na Bearu community garden in Bagenalstown. During the spring of 2017 Greenside Up created a small living green roof structure and provided a morning workshop to the local community about creating living green roofs in gardens and how they can attract beneficial pollinators. 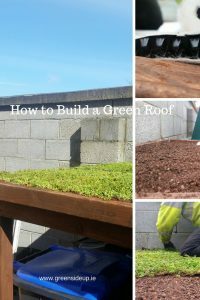 The following details the steps we took to build the green roof structure and why we should all consider installing one. Before you begin to make plans, be aware that this isn’t a project for tight budget. 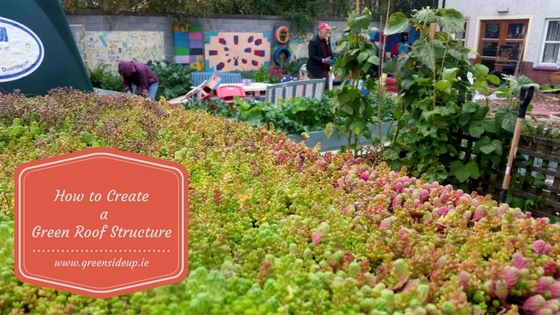 The material costs can quickly add up with an *inclusive sedum pack costing in excess of €45 per square metre alone. However with some basic maintenance, a green roof will happily grow for many years, outlasting patio furniture or barbecues. We bought our green roof ‘package’ from Green Roofs Direct in Belfast who supply projects of all sizes, from 10m² to 10,000m². We also found Landtech Soils in Tipperary extremely helpful. Mitigating water runoff and subsequent overflow into the sewage system. Soil and vegetation acts as a sponge, absorbing and filtering water that is normally taken into gutters. The plants remove air particulates, produce oxygen and provide shade. Green roofs help to cool the air as water evaporates from the leaves of the plants – a benefit in urban areas in a warming climate. Green roofs have a biophilia effect, softening hard structures and making us feel better. Green roofs can provide safe, secluded spaces for wildlife and pollinators. They provide great views for you and your neighbours! The Gleann na Bearu community gardeners asked for a structure that would hide the wheelie bins in the corner of the garden by the oil tank. They wanted it to be high enough so they could lift the lids of the bins without pulling them out. Although we might have been able to source cheaper upcycled materials, we wanted to provide a professionally built structure that would last. We therefore sourced treated wood from our local timber yard Griffiths Timber who offer a great service. 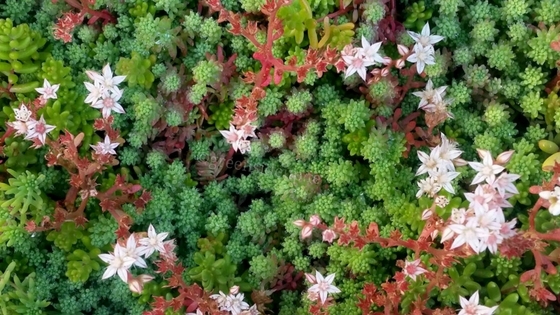 Although we could have chosen various grass mixes for the green roof, we chose sedum for its low maintenance and pollinator friendly attributes. 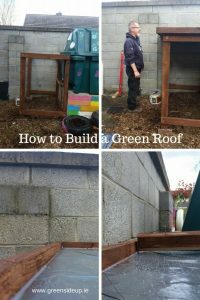 Woodworking skills are necessary for this project but once the structure is in place, the green roof itself is very easy to install and maintain. 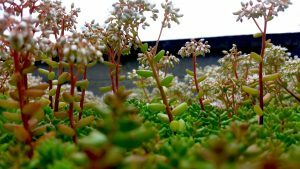 The following gives a general guide to creating a living green roof using various varieties of sedum. 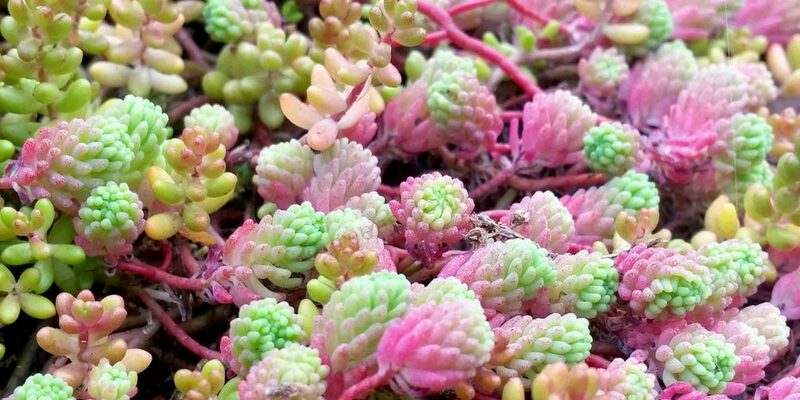 The varieties included Sedum acre auream, Sedum album Coral Carpet, Sedum album Mini, Sedum album Athoum, Sedum hispanicum, Sedum Summer Glory, Sedum reflexum, Sedum Weihenstehaner Gold and Sedum voodooedum. Draw your plan, cut and bolt the pieces of timber together to fit and paint the structure with an additional protective layer to ensure it will last. We chose a treatment that isn’t harmful to the environment and is relatively long lasting. Once the skeleton of the structure was in place. We added a slightly angled piece of marine plywood on to the top, added more timber around the top edge of the roof to ‘hold’ the sedum and drainage materials in place. At the lower edge of the sloped timber we cut a few notches to allow excess water to drain. Finally a sheet of heavy duty plastic was placed over the marine plywood and all the edges were then sealed with a waterproof sealant, leaving the structure ready for the drainage layers, substrate and sedum. 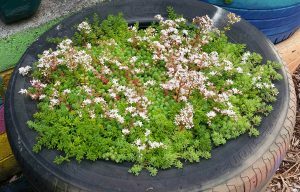 our sedum blanket from Green Roofs Direct who supplied the drainage layer, substrate and sedum in kit form. Once the green roof structure has been built, adding the drainage and plants is easy. Simply cut the three layered drainage provided and fit it to size, add a 30mm layer of substrate over the top and rake it until smooth. Finally unroll the sedum blanket and cut the pieces to size, taking care not to overstretch it. Once covered, water the sedum until the water runs out. Green Roofs Direct recommend a straightforward maintenance plan. For the first twelve weeks simply water and weed. Watering in the first week is crucially important. If the sedum blanket is rolled out in very dry conditions it must be watered every other day during the first week. A quick establishment is very important for the plants to cope with the harsh conditions on a roof. Slow release granular fertilizer can be applied in April at a rate of 10 grams per square metre. A handheld broadcaster is ideal for larger roofs and can be purchased in any hardware or DIY store or hired. Flowers can be cut and removed in August then slow release granular fertilizer applied again in October at 10 grams per square metre. Have you considered installing a green roof into your garden? This one never fails to bring a smile to our faces. *includes three piece drainage layers, 50mm depth of substrate and one year matured Irish Sedum Blanket. I’d love to build one of these in my back garden. Thanks for the guide. Great! Hope it helps, the sedum is beautiful too. Let me know if you ever do! I would like to grow this on my new fibreglass flat garage roof. Would that be possible? If so what would l need to do?